Coffee pecan & date cake! This is a cake my mum and sister both love. 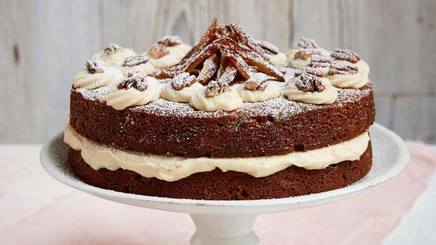 It includes dates, one of their favourite ingredients, which make the cake wonderfully rich yet moist, with an almost toffee flavour. The matchstick dates piled on top look like a bonfire, so this is perfect for today. Just don’t have a slice before bedtime — the coffee has a kick.